"What's that noise?" said Lapnet the demi Goddess. "That sounds like a Gresini Racing Honda," said the Wabbit, "and it's flying like us!" The rider was waving across to the Wabbit and shouting something, so the Wabbit brought Turbina alongside. "Am I heading the right way for the Elysian Fields?" asked the rider. "Oh no Marco, it's you," cried the Wabbit. "How did you get here? And why the Elysian Fields?" "Ciao Wabbit! 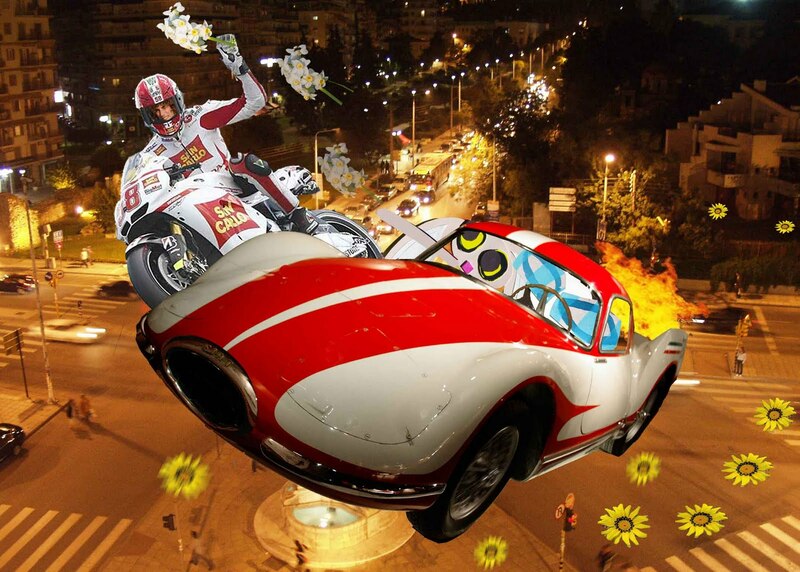 I'm afraid I ran out of road," said Marco Simoncelli, the motorbike champion. The Wabbit was very upset and tried to hide it from Marco. "He's too young," whispered the Wabbit to Lapnet. "But he was brave and heroic," replied Lapnet. "Yes he was," said the Wabbit and he leaned out of the window. "Marco!" shouted the Wabbit. "I have to ask you if you would change anything." "No," yelled Marco. "I wouldn't change a single second of it" "I told you," said Lapnet to the Wabbit and she threw another bunch of flowers from the window. Marco caught the flowers with ease and held them high in the air and shouted "Grazie!" "Prego," smiled Lapnet sweetly and waved. "We're headed for the Elysian Fields now," she said. The Wabbit didn't have to think for very long. "Why don't you come along with us, Marco," suggested the Wabbit. "I'll race you there," said Marco.